Dogs Who Love "101 Dog Tricks" Facebook Wall and More! Having your children train the family dog through trick teaching is an ideal way to build a safe and respectful relationship early on, build a bond between your dog and the kids, build confidence, and make it fun for everyone! 101 Dog Tricks, Kids Edition will teach you everything you need to know to involve your children in training the family dog. This book presents full color photos of kids working with dogs for each trick, along with training steps, to make it easy to follow along. The step-by-step approach, difficulty rating, and prerequisites will allow you and your child to start training immediately. No special tools (such as clickers) or knowledge of specific training methods are required. Each trick is specifically targeted at kid level fun. Tricks include blowing soap bubbles, which hand holds the treat, weenie bobbing, and more. This book also includes a fun arts and crafts section that includes tons of fun activities for kids, including: pawpainting, personalizing dogwear, baking dog treats, crafting homemade dog toys, and snapping pet portraits. Join Kyra and Chalcy for some dog training family fun! Quarry Books is looking for submisions for two new books: 1000 Kids Art Ideas and 1000 Quilt Inspirations! Click here for the details for 1000 Kids Art Ideas and 1000 Quilt Inspirations. How to bead a cactus! Get your upcycled and repurposed art and design published in Art Without Waste: 500 Upcycled and Earth-Friendly Designs by Patty K. Wongpakdee. Calling all earth-friendly designers and illustrators, eco-artists, and green DIY enthusiasts! Rockport Publishers wants to see your amazing art made from non-traditional materials. Harness your creative passion to create dynamic forms that encourage the viewer to perceive discarded items in an entirely new light. Winners will be published in a new showcase series on the Rockport Publisher's list, which will feature 500 projects-similar to the 1000 series. There is no entry fee, and because of that, we cannot provide free copies of the book to those whose work is chosen. However, we do offer a 50% discount on copies of the book. Winners will be featured in Art Without Waste: 500 Upcycled and Earth-Friendly Designs, a 192-page, full-color book slated for publication in the fall of 2014. For all details about how to enter, click here. Rockport Publishers specializes in books for design professionals. Our publishing program includes graphic design, interior design, crafts, architecture, product design, and general reference. Our worldwide book distribution offers designers the opportunity to show their work in an international forum. Rockport Publishers will be celebrating the most beautifully styled food in their new book, 1000 Food Styling Ideas. Food preparation is an art form and we'd like to see your creations published in this full-color, 320-page book slated for publication in fall 2013. Any image of a food or drink item photographed within the last two years is eligible. Photos that have been published in other Rockport books are not eligible. There is no entry fee and, because of that, we cannot provide free copies of the book to those whose work is chosen. However, we do offer a 50% discount on copies of the book for contributors whose work is chosen. Please send digital submissions. (Click here for submission details.) There is no entry fee and you may submit as many entries as you like, but be sure to complete a separate form for each entry. The information you provide will be used in a caption to accompany your submission should it be selected, so write legibly, be as complete as possible, and double check all spelling. Incomplete or illegible forms will be disqualified. Submit your entry by October 1, 2012. Please complete and upload a Grant of Rights form for each project entered. Submissions will not be considered if unaccompanied by Grant of Rights forms. Browse through this list of unique, homemade Halloween costume ideas and then share yours! Aileen shows you how to turn a washing machine lid into a chalk/magnetic board! Carmi had no idea making molded soap was so easy!! Cherie makes a sculpture using green and gold glasses. Download a free book excerpt from the adorable new title How to Make Stuffed Animals published by Quarry Books. 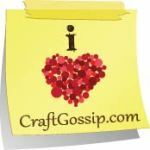 This week, The Artful Crafter tells how you can create free yarn crafting patterns online. Twist twist twist some wire. Make a bracelet. Wear with pride! How to make a recycled champagne cork acorn. Call for Entries: 1000 Incredible Cosplay & Costume Ideas - deadline extended! They are putting out a call to artists to submit their most amazing cosplay photographs for compilation in 1000 Incredible Cosplay & Costume Ideas, an exciting upcoming book by Dr. Grymm (Joey Marsocci) and Allison DeBlasio of Dr. Grymm Laboratories. Rockport and Quarry are not just looking for the best in each category, but for unique, dynamic, and high quality photography of characters and props. All costumes and props must be original works. Photos submitted by the photographer must be submitted along with a model release and the name and country of origin of all subjects. Rockport and Quarry are looking for sophisticated images to help elevate the world of cosplay. If you would like to submit photos taken at conventions, please make sure the backgrounds are free of clutter, crowds, and other patrons. They will accept Photoshop effects when appropriate. Acceptance begins immediately: early submissions are encouraged. Click here for spec information and submission details! And Monday Links - yah didn't think I forgot, did yah? Come join the fun: The Artful Crafter is celebrating its 6th blogoversary. Party favors, cupcakes and prizes for all! Cyndi is going to be giving away the whole Stash Happy series over the month of July...starting with the fabulous Applique book!